Whether ‘tis nobler in the mind to wait, suffering the slings and arrows of outrageous fortune, or to take arms against a sea of troubles, and add one now? The device I speaketh of is my iPod Touch, and the slings and arrows of outrageous fortune that I suffer is that when I’m out and about, like today, and the Pats (insert your favorite team here) are on, I need to carry my little micro AM/FM radio with me. Apple didn’t see fit to bestow upon my Touch an FM tuner, so I have little choice in the matter. They added one to the latest generation Nano and iPhone, but sadly, not to the Touch. Luckily, there’s an FM tuner that works with the Touch, iPhone and 3rd gen and up Nanos, The Griffin Navigate. It’s a slick little inline remote with an OLED screen, and it doubles as an FM tuner. 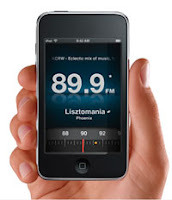 It can also be used with Griffin’s free iFM Radio Browser app that will look up all the available stations in your area and auto program them into your Touch or iPhone. Pretty cool! Ay, but here’s the rub; 9to5Mac and other sources are reporting that there’s a dormant chip in the 3rd gen Touch, that when activated will allow both Wireless N and FM receive and transmit. Hmmm, sounds a little like their Bluetooth chip that an upgrade, for a price, to OS 3 gave greater functionality to. It’s been hypothesized that Apple may unveil this little on board extra as soon as this January. So, is it worth shelling out 50 bucks for FM tuner functionality today, when the device may be unnecessary in a couple of months? For me, yes. I have a 2nd gen Touch and a 3rd gen Nano. The Navigate works with both devices and neither has the dormant onboard capability, but if you own a new 3rd gen Touch, nuh-uh. Wait awhile, and you may save yourself some money. 50 bucks will buy you a pretty decent dinner, or a couple of my T-shirts! By the way, the Patriots bested those knaves from Miami today, and I would have missed our plucky knight's great moment of victory, were it not for the lowly FM broadcast. What say you now, Master Porter?